Manufactured from black bakelite, these Sterolist viewers were made in England in the 1950s. 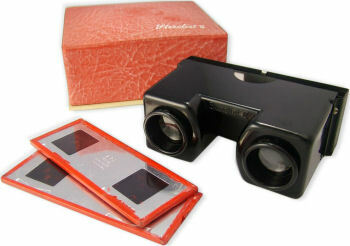 The illuminated model was the English equivalent to the Stereo Realist Red Button viewer, but it had one major improvement, namely the ability to accept wider slides up to and including the 7 Perforation European film format. A simple grab-light Sterolist II viewer. 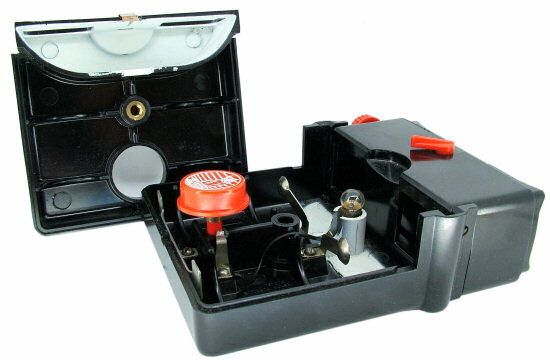 The main body of this simple grab-light viewer was made from bakelite and the slide holder was manufactured from black painted metal attached by two screws. The lenses were made from glass and had an inter-ocular spacing of 65mm. The viewer was supplied in a textured box with a domed lid. Sterolist II viewers are extremely difficult to find and were probably not made in large numbers. The excellent quality viewer shown below offered both inter-ocular adjustment (the ability to move the viewing lenses to match the users eye spacing) and also focusing. The viewer had glass double element lenses giving a clear, sharp image. The viewer was powered by two 1.5v 'D' size batteries and the lamp was activated by pressing the red button at the rear of the device. The Sterolist viewers are often found in wooden presentation boxes that also have space for twelve stereo views. The inside the UK made Sterolist is almost exactly the same as the inside of the USA made Stereo Realist Red Button Viewer.